The emotional trauma and bonds of brotherhood that results from experiences in war are explored in the new movie Last Flag Flying. Written and directed by Richard Linklater, the movie stars Steve Carell as a man who learns his son, who followed his example and joined the Marines, has died in the Iraq War in 2003. 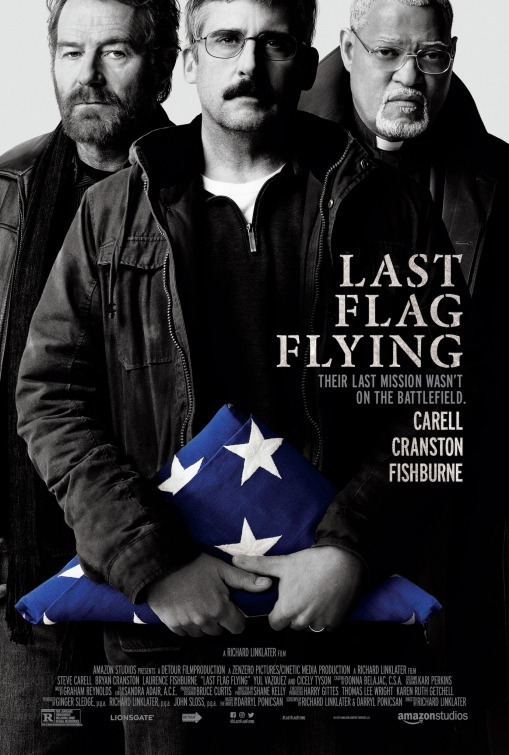 Before setting out on the trip to claim his son’s remains for burial, Larry (Carell) tracks down and enlists the help of two of his closest friends from their time in the service, Richard (Laurence Fishburne) and Sal (Bryan Cranston). Larry doesn’t just want to be there for his son’s return but wants to take him back to his hometown for burial, eschewing – to the surprise of most – a ceremony at Arlington National Cemetery. We meet Sal and Larry as the trailer opens, with them having taken some sort of impromptu road trip and go find Mueller. All three were buddies in the Marines back in the day and Larry’s son, who did likewise, has been killed. The Corps wants to bury him at Arlington, but Larry wants to bring him home, so his friends join in the effort, despite the obstacles. So it’s being sold as a road trip movie featuring three reunited old friends. What sets this apart from other movies that have had similar stories is the talent and charisma of the three leads as well as the emotional story. This isn’t a crazy comedy where there will be at least three Viagra jokes, the trailer promises, it will be a drama about family, grieving and your duty to old friends. It should also be noted that for as many times as I’ve watched this trailer, I still well up every damn time. It’s the music. It’s the story. It’s the stoic grief. It’s…yeah. Load up the official website and the trailer starts playing in case you need a good cry this morning. Once it closes you get a recreation of the key art of the three actors looking somberly at the camera. There’s a prompt to get tickets on the page while at the bottom are links to the movie’s Facebook, Twitter and Instagram pages. Moving on to the content menu at the top of the page, “Synopsis” offers a brief write-up of the story. Skipping over “Videos,” which just has the trailer, next up is the “Gallery,” where you can check out a number of production stills. Some online and social advertising was done around the release of the trailer as well as in the last week using the trailer, short clips or variations on the key art. While I couldn’t find them online, it does seem some TV advertising was done recently, with the movie’s Twitter account sharing a photo of a commercial that apparently aired during one of this past weekend’s World Series broadcasts. News broke back in June that the movie would get a high-profile debut by screening at this year’s New York Film Festival, where it went on to garner decent praise and buzz and where Linklater talked about it briefly, including praising Amazon Studios for helping him to make the movie after a decade of false starts. Shortly after the first trailer debuted and while the movie was screening at festivals Linklater talked about finally making a movie about grown-ups, how time spent with friends inspired some of the story and more. While at NYFF, Fishburne addressed how the intent was not to tie the movie to anything overtly political happening at the moment but to tell the story of a father doing what he can to grieve for and honor his dead son. Linklater made similar comments, saying the story would have played out the same even if Hillary Clinton was currently occupying the White House. Where the movie falls in Cranston’s career was the primary subject of this feature interview as well as how he decides what roles to take, regardless of how they might be viewed by others. Cranston and Carell have made a few media appearances in recent weeks and will likely be making more in the coming days as we get close to release. Amazon Studios’ campaign isn’t massive, possibly because it follows just a week after the release of Wonderstruck, for which there was a much more comprehensive and general push. That’s not to say it hasn’t put a solid or committed effort together, just that the lack of additional paid efforts and a more subdued publicity campaign adds up to signal that this is a movie it doesn’t think will have the widespread appeal of that other movie. While the volume may not be quite what we’ve seen for other movies, the emotions here are the real selling point. Everything about the campaign wants you to feel Larry’s conviction, determination and stubbornness deeply, mostly be experiencing them through the filter of Sal and Richard. Linklater has underscored this in interviews, but there really isn’t anything political in the campaign. It’s just about a father who wants to do right by his son and needs the emotional and other help of two men he’s always been able to count on. It’s not taking a stance on the war or anything, it’s just about dealing with a tragedy no parent should have to face in the most manageable way he can.